I can’t believe it’s been over a week since I spent a really fun three-day weekend at CampBlogaway in the Los Angeles mountains, seeing all my blogger friends, listening to blogging presentations and learning all about the sponsor’s products. Which were all food related and potentially blog-worthy. I came home with 4 big totes filled with sponsor-provided swag, one of which were several mangos. I was really thrilled to have them as I love mangos and was trying to decide in which recipe I would use them. Well, a day after I returned, I got an email from the National Mango Board telling me they were sending me a box of mangos and it would arrive in the next couple of days. What was I going to do, say no? No way. So, guess what, I am now awash in mangos. They’re in the fridge and on the counter. I could never use up all these mangos in one recipe in a million years, so I decided to make as many recipes as I could until the mangos finally run out. This should be interesting. A little mango madness. #1. Lol. 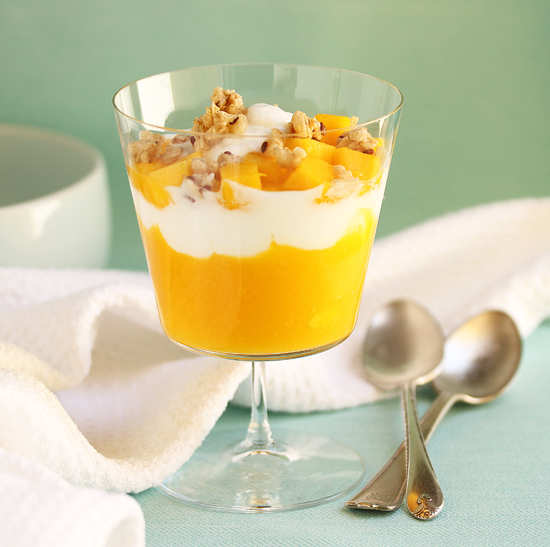 I found this recipe for Mango & Yogurt Parfait in a little cookbook from the National Mango Board that was part of our swag. I chose this recipe because it not only looks delicious, but it has a large amount of just pure wonderful mango. And, of course, because it’s photogenic. If you have never peeled and pitted a mango, here is a video of how to do it. It’s not rocket science. As long as you get the mango out of the skin, by hook or by crook, you’re good to go. 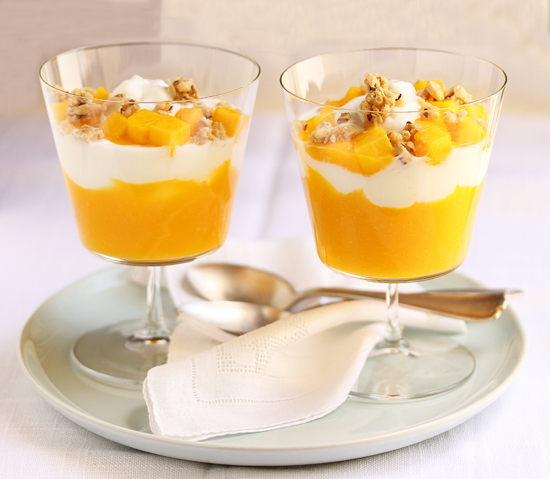 So go buy two mangos and try this recipe. Share it with a friend. You’ll be so glad you did. 1. 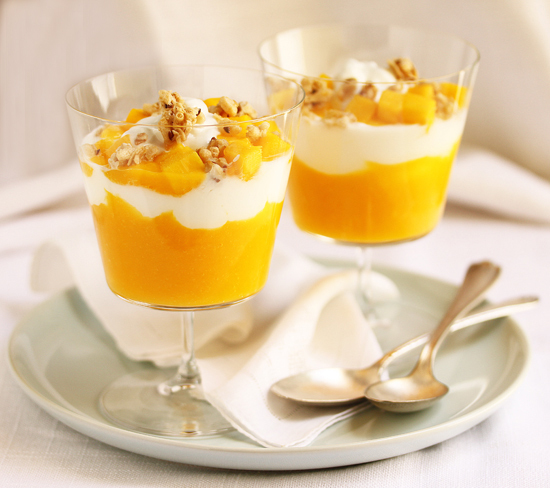 Spoon equal amounts of mango puree into 6 clear plastic cups or parfait glasses. I love mangoes, and your photogenic pics just reminded me how much! looks wonderful – delicious and healthy too.